A second order partial differential operator is applied to an image function. To this end we consider both the Laplacian and a more general elliptic operator. By using a multigrid operator known from the so-called approximation property, we derive a multiresolution decomposition of the image without blurring of edges at coarser levels. We investigate both a linear and a nonlinear variant and compare to some established methods. de Zeeuw, P.M. (2007). 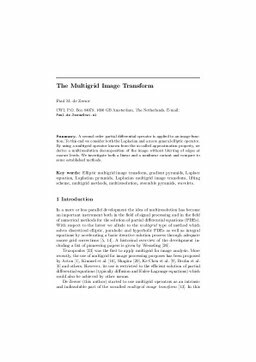 The Multigrid Image Transform. In X.-C Tai, K.A Lie, T.F Chan, & S Osher (Eds. ), Image Processing Based on Partial Differential Equations (pp. 309–324). Springer Berlin Heidelberg.